There are several alternatives when considering boat storage. Is it best to leave it in a wet storage year round? On the other hand, dry storage may be a better option for you. What is best for someone else and their boat may not be best for you and your boating preferences. Is your boat used in fresh or salt water? Is it too large to haul out with a pickup truck or SUV? If so, then it requires dockage space. Whether you choose wet dockage or dry dockage depends on the level of access to your boat that you wish to have. Many marinas that offer dry dockage request that you allow them 30 minutes to 24 hours to put your boat in the water. If you are one of those who want access to their boat 24/7, this may not be the best option. Boats that used in salt water on a continual basis can benefit from dry storage services. Salt water can wreak havoc with your engine, your boat's finish, and all of your boat's systems if they are not maintained. Regular cleaning helps keep your boat in good shape. Boats that are in fresh water also need to be cleaned, but the environment is not as harsh. Boats that are kept in wet storage require bottom paint, whereas boats kept in dry storage do not. Keep this cost in mind when deciding between wet and dry storage of your boat. Many marinas that dry store boats will wash them down after they're pulled from the water. Some marinas also offer an engine flush as part of the pull out. This is an important part of preventive maintenance that will keep your engines operating smoothly. When inside storage is available, you can keep your boat out of the elements. This can be a benefit in New England because your boat will be protected from snow and ice all winter. For those of you who want to get in your boat and go without the hassle of making prior arrangements, as well as for large boats, wet storage is the best option. There can be issues with keeping your boat in wet storage in the winter. Ice buildup around a boats hull can be addressed with bubbler systems that prevent ice from forming. 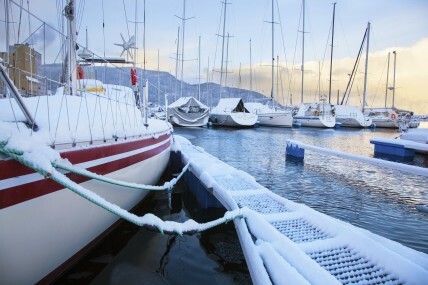 However, the weight of snow build up and melt on smaller boats can create problems. Whether you haul every year or every other, taking the necessary precautions to store your boat for the winter will help you enjoy many more years on the water.